View of Mt. Fuji on the Tokaido. In the foreground, a man is fishing in a river, while another is pulling a rickshaw with a passenger. The caption calls the place Mitake. As Mount Hoei is clearly visible on the right, this must be nearby Yoshiwara Juku in Shizuoka Prefecture, the fourteenth station on the Tokaido. Going from Edo to Kyoto, this was the only area along the Tokaido where Mount Fuji was seen on the left. 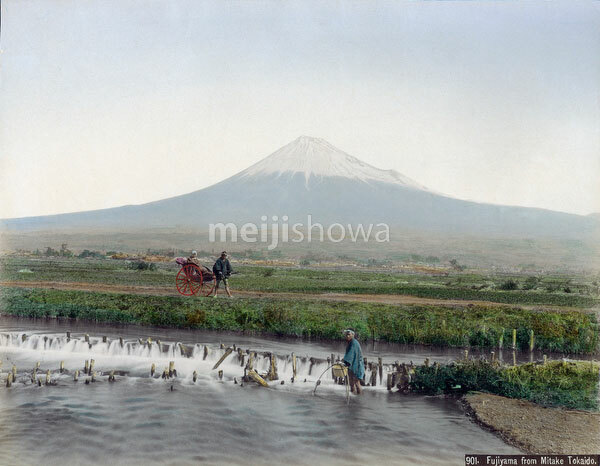 The area was known as “Hidari Fuji” (Left Fuji).